Published by Editor on April 1, 2013. A veterinary student examines a teddy bear during a Open House at the UT College of Veterinary Medicine. This year’s event is scheduled for Saturday, April 20, and is free and open to the public. The University of Tennessee College of Veterinary Medicine will hold its annual open house Saturday, April 20, from 9 a.m. until 4 p.m. The free event will take place, rain or shine, on the UT agricultural campus, located on Neyland Drive. 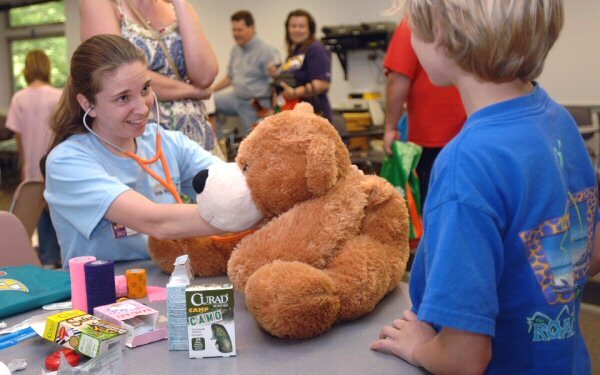 Children are encouraged to bring their stuffed animals to the Teddy Bear Clinic for veterinary students to examine. Guests will learn about dog bite prevention and tour exhibits featuring small animal medicine, large animal medicine, community organizations, and pet rescue groups. The anatomy lab with various skeletons and plastinated specimen is always a crowd favorite. Canine and equine parades of breeds are scheduled throughout the day. Guests can also enjoy learning about various cat breeds. The Open House starting point has moved to the newly expanded and renovated Equine Hospital. The Farm Animal Hospital is still under construction and will not be included in this year’s Open House. No registration for individuals is necessary. Please do not bring pets to Open House. Groups of 15 or more are asked to visit the “frequently asked questions” section of the website at www.vet.utk.edu/openhouse for further guidelines. The self-guided tour begins in the equine arena and continues through the Veterinary Medical Center. The veterinary open house is held each year to better acquaint the public with veterinary medicine and services provided at the UT College of Veterinary Medicine, which was established in 1974. Visit www.vet.utk.edu/openhouse for additional information. One of 28 veterinary colleges in the United States, the UT College of Veterinary Medicine educates students in the art and science of veterinary medicine and related biomedical sciences, promotes scientific research and enhances human and animal well-being. In addition to the programs of the College of Veterinary Medicine, the UT Institute of Agriculture also provides instruction, research and public service through the College of Agricultural Sciences and Natural Resources, the UT AgResearch system of ten research and education centers and UT Extension offices in every county in the state.